In a previous blog, entitled “Wont’ Read, Can’t Read”, I argued how we need to focus on the large role that education could play in changing and improving on the fact that half of US children read at a basic level and few become fully proficient. The way we teach children to read isn’t working. Teachers lack the training and knowledge in how reading actually works or what to do when reading isn’t happening at all for some students. 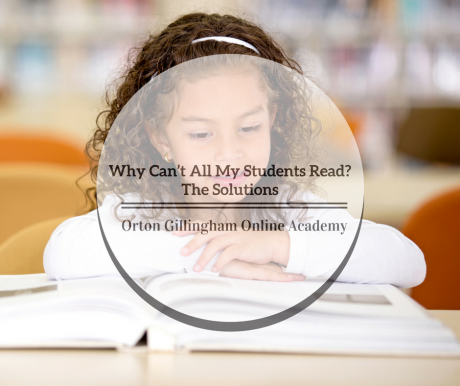 Following on from my previous blog, “Why Can’t All My Students Read? A Teacher’s Perspective”, I will examine some of the possible solutions to the issue of adequately preparing teachers to teach reading. So can we better prepare teachers to teach reading? While discussing the possible solutions, I have tried to include some of the pros and cons of implementing each option. Mark Seidenberg, in his book “Language at the Speed of Sight,” isn’t hopeful that many educators of teachers are open to the latest reading science ideas, or that a teacher education program that included developmental psychology, linguistics and neuroscience, would be accepted by university educational departments. He argues that although these are already offered outside of the teacher training courses, educational departments are reluctant to work with other departments that they feel have not valued them. He feels that schools of education are unlikely to change as their culture is well entrenched and incremental changes are preferred over large more sweeping changes, which are necessary to improve the current situation. He also fears that if more rigorous programs were created to train teachers, the additional work credit requirements and more challenging workload would dissuade potential applicants. One alternative would be professional training schools allied with public schools, which would allow for mentored apprenticeships and keeping research tied to practice. The danger is that these would just be “laboratory schools,” and it would be impossible to create the number required to make a real difference. Dr Emily Cantrell, a clinical assistant professor of Reading and Language Arts Education at Texas A&M University, paints a more promising outlook in terms of the professional development for educators of teacher in higher education. In the Podclassed episode that dealt with this topic, she discussed a professional development project that involved teacher-educators being invited to meet with leading researchers in the field of reading science. They learned about new research and how they could include that instruction in their teacher preparation programs. A major eye-opener was realizing that the Whole Language approach was not sufficient for children to become proficient readers. Dr Cantrell is hopeful that professional development for teacher-educators could make a huge difference, but she is aware that change takes time and that a lot of progress needs to be made. As already mentioned above, widening the scope of what is offered in teacher preparation courses isn’t likely to happen on a scale large enough to make a difference. Ongoing professional development for some teacher-educators is making some difference, but it is hampered when the emphasis is still on Whole Language or Balanced Literacy, instead of foundational reading skills. Mark Seidenberg suggests a career prerequisite of a Linguistics 101 course would cover much of what teachers need to know to understand language and therefore teach reading successfully. It may also be attractive to schools of education as it would include items of interest to them too. The ideal would be class lectures that cover the science of reading, and a full year of undergraduate study in phonetic instruction and basic foundational reading skills, including practice in classrooms using scientifically researched programs with students. However, this is perhaps a long way off until more teacher-educators have been trained. The NCTQ also argue for final exams that cover both the knowledge of teaching someone to read, and the method, which would include teaching reading to English Language Learners and classes of children. They suggest effective, stand alone, reading tests for prospective elementary education teachers, which measure what they need to know about reading. Liz Barnes, a foundation member of Decoding Dyslexia of New Jersey (DDNJ), discussed her reasons for pushing for changes in legislation that will impact teacher certification in Podclassed Episode 2. She tells the story of a teacher she met, who once enlightened about the science of reading, described what she had been doing previously as “Educational Malpractice.” DDNJ are sponsoring a bill that would require teacher candidates for licensure in Preschool to 3rd Grade, elementary education, or seeking a reading specialist endorsement, to pass a written test to show they know how to teach reading. This would of course include the essential components of reading known as The Big Five. She explains that these changes need to be alongside of placing teachers in classrooms using evidence-based practices. She realizes that school districts need strong professional development to learn about new research in the science of reading, but also says that universities need to change how they are training and educating new and future teachers. Mark Seidenberg argues that a rigorous test, as part of the state licensure that allows teachers to enter the teaching profession, is a valid way to avoid holes in basic knowledge, though he doesn’t feel it is an effective mechanism for achieving real changes in teacher education. He fears that raising the bar may give way to to alternative paths to certification that by-pass the exam. He doesn’t personally feel that a top-down regulatory approach is a viable path to systemic change. This is big business and some of these programs could reduce the need for teacher expertise. They are certainly not as effective as an outstanding teacher, but they may be more effective than undertrained and inexperienced teachers. They certainly aren’t cheap and in many low income districts they aren’t an affordable option. This would include commercial learning centers, and those like myself that offer specialist tutoring services. However, I realize this generally requires sufficient means on the part of a parent. Even free programs often require access to a computer and the internet, which isn’t always possible. Mark Seidenberg suggests that school districts could offer free teacher training at a local level which shifts the bill for education from students to taxpayers. Perhaps this competition would reawaken traditional training programs. A more affordable solution would be professional development at a district level. Mark Seidenberg proposes in his book, “Language at the Speed of Sight,” repurposing Teach for America (TfA), so they could become the American Reading and Language Corps. They could still achieve TfA’s goals of reducing achievement and opportunity gaps in public schools. Corps members would require short term intensive training for teaching reading, but they wouldn’t need to learn the skills to run a classroom. He feels this has the potential to inspire people to choose an educational career and one in which they will already be aware of the science of reading. 8. Professional Development: Retraining in districts for all K-3 teachers and reading specialists. This is an option that a number of school districts across the country are considering. Alongside of a Reading and Language Corps, this could go a long way to improving the reading outcomes for a number of children in the short term. The Orton-Gillingham Online Academy offer, as well as personal online training, a number of onsite training options. For further information about this training, please take this link. 1. Mark Seidenberg. Language at the Speed of Sight: How We Read, Why So Many Can’t, and What Can Be Done About It.